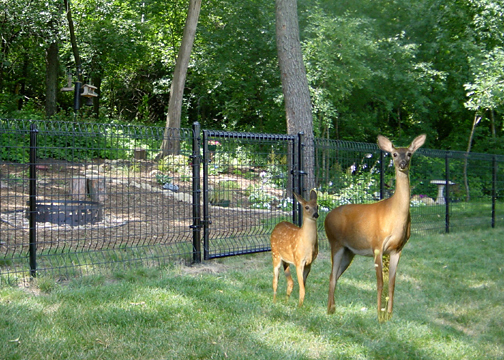 You are here: Home / Fence School / Can fencing protect my property from wildlife? Mother Natures animals can often be a challenge – and they are not limited to rural areas. Use of a properly designed fence can protect your property. Normal chain link fence has 2” to 2 ½” holes. Rabbits go through that. You need approximately 1” mesh to prevent the pesky varmints from getting in your garden. And the height need not be very great; 2 or 3 feet will do. This fabric can easily be attached (zip ties?) to another type of fence (wood picket, chainlink, ornamental metal, etc.) You can do it yourself!